Well, I’m finally back home in Louisville. During the two weeks leading up to my departure, I tried to cram in all of the sightseeing and activities in Barcelona that I had neglected to accomplish. I visited Gaudi’s Casa Batllo and spent a few days on the beach, but I also made time to revisit some of my favorite locations in Barcelona, such as the hill with the stone Cross in Parc Guell. I’m not going to lie, these final weeks have been hard. I’ve experienced a wide range of emotions, but I did pretty well in controlling any sadness that crept into my mind. I put off discussing my departure with my host family until 2 days prior to actually leaving because I just couldn’t handle saying goodbye to the people who had taken me into their home and treated me as if I had been a member of their family for my entire life. I miss them immensely, and I am forever grateful for all of the things that they did for me. Luckily for me, I only had to take two flights to get home, whereas I took three on the way to Barcelona. In total, I flew 18 different times while studying abroad, so it really had become a normal part of my routine for me to hop on and off of planes. I was thrilled to see my family waiting for me in the airport with “Welcome Home” signs, and that quickly took my mind off of leaving one of the greatest cities in the world. And of course, I immediately began planning where I would eat over the next few days….BW3s, Qdoba, Taco Bell, etc. My mom and sister have put together a party celebrating my return this Saturday, so I am very excited to see the rest of my family and friends. 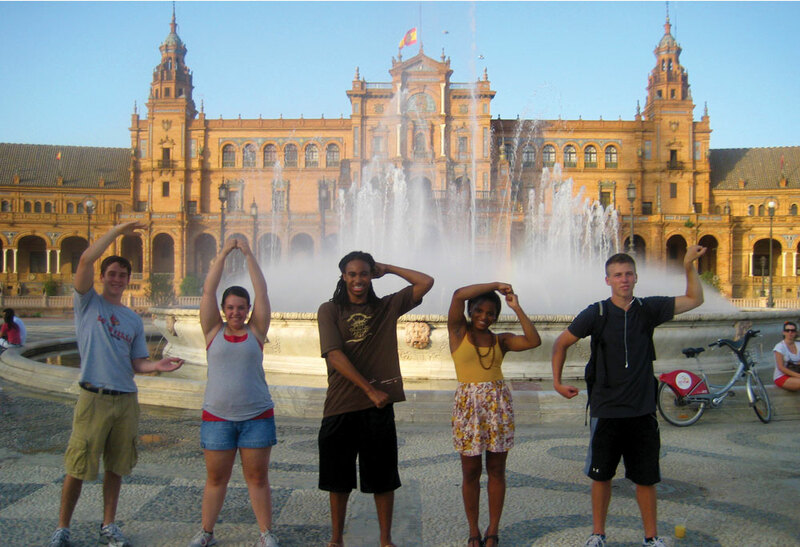 Looking back, study abroad has easily been the greatest experience of my life. I remember being very scared and sad to leave my family, but I never really dealt with very much homesickness. With modern forms of communication, it really is no big deal being halfway around the world. Of course, it was quite different to not physically be around my family and friends each day, but they were never more than a quick Skype call away from me. I can’t point to a specific moment in my time abroad that really changed me, but the entirety made me significantly more responsible and also opened my eyes to the wonders of this amazing world we live in. I loved the energy that came with living in a foreign city and traveling to other cities practically every weekend. I was always out exploring other cultures and seeing how people live in different parts of the world. I hope that I can take this excitement for exploration and incorporate it into my life in Louisville. I know that everyone always says how amazing Europe is, and they aren’t lying. But, I’m confident that our own city, state, and country can be just as invigorating and magnificent if we don’t take it for granted. Wanderlust after study abroad is a very real thing. I haven’t been back for very long at all, and I am already thinking of ways to explore the world next summer. I hope I can go back to Barcelona to visit my host family very soon; it will forever be my second home.